There are 99 active fires burning out west - and more than 23,000 people from across the nation working to put out the flames. A group from New Hampshire just wrapped up a two-week mission in Montana and Idaho, making it back to Manchester Wednesday morning. "When you are driving for an hour through nothing but burned out forest to get to where you're working, that's a lot of fire," said New Hampshire volunteer Leo Maslan. They started at the Holter fire in Montana. "It was a big fire, like 700 acres," said another volunteer Brian Charland. 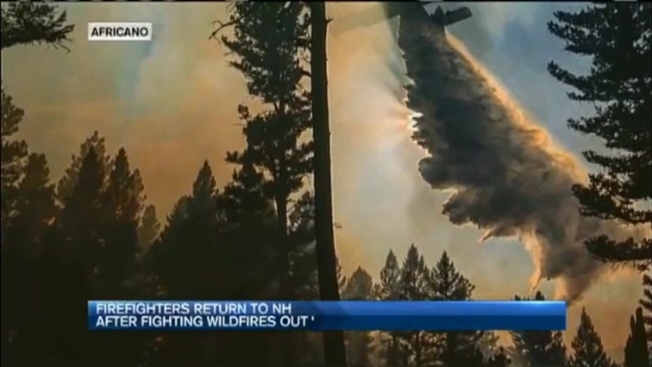 Then they were dispatched to the Motorway Fire Complex in Idaho's Clearwater National Forest. "Some of the trees we saw devastated are 300, 350, 400 years old," Maslan said. "That's kind of tough to see that kind of damage firsthand." The group of 20 Granite Staters volunteered to spend their vacation time doing anything but relaxing. "To know you did something to make a difference gives you a good feeling," said Nick Africano. Several months in and they say it's still a raging battle against the monstrous fires out west. "It's just dry, dry, dry," Charland said. "It's unbelievable." Flames are ripping through millions of acres, burning down neighborhoods, and threatening entire cities and towns. "Being a homeowner you realize in an instant all that changes, and that brings it back home a bit," Maslan said. It's tough work for all of the 23,000 firefighters involved right now, but they'd all tell you it's well worth it. "It's part of who I am and what we are," Maslan said. "There's signs up, 'welcome firefighters,' makes you feel appreciated." The last group of New Hampshire volunteers will be flying back to Manchester by the end of the week. We are told that there could be another New Hampshire crew activated.